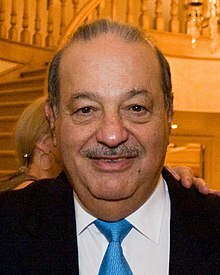 Carlos Slim HelÃº (Spanish pronunciation: [ËˆkaÉ¾los esËˆlim eËˆlu]; born January 28, 1940) is a Mexican business magnate, engineer, investor and philanthropist. From 2010 to 2013, Slim was ranked as the richest person in the world by the Forbes business magazine. His conglomerate includes education, health care, industrial manufacturing, transportation, real estate, media, energy, hospitality, entertainment, high-technology, retail, sports and financial services.